The person is initially oriented to external realization (the Moon outside the Earth's orbit) and develops in the same direction (the Moon moves from the Sun). In the second quarter, the yang is growing, it is greater than the yin. People with such a Moon in the natal chart are initially oriented to the outside world and can master it. In the sky one can see more than half of the lunar disk - the born has a lot of vitality, almost all the energy outside, in the trunk and crown, and not in the roots. From the very beginning, it is as if adapted to the world in which it lives. This is the most successful type of people socially, they most easily achieve the desired, very practical, specific, but not in the sense that everyone knows how to do by hands - their possession of the world around them is determined by the fact that they are able to relate their desires to reality, what opportunities this world gives them, and are able to use them. In other words, such people as quickly and easily realize what they came to. All that you want to consume immediately, you can collect with the growing moon, as well as cook jam and make juices. From the second quarter of the lunar cycle and up to the full moon (including it), it is also recommended to harvest branches, shoots, leaves and flowers. 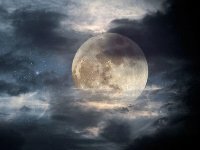 With the growing Moon, the body accumulates energy, gaining strength, and it is undesirable to waste it at this time, since even a small load can lead to exhaustion. At this time weaker immunity, we are more difficult to bear even minor ailments, wounds bleed more and heal less. The second quarter of the growing Moon occurs at a time when the Moon is gradually starting to turn into a full moon. During this period, the astral forces are able to create real miracles. The most successful moment arrives for carrying out magical rituals for gaining vitality, gaining authority, significantly improving well-being and even turning the fortunes and character of a person for the better.